Page 123 – Cultural Critic. Bibliophile. Dramatist. 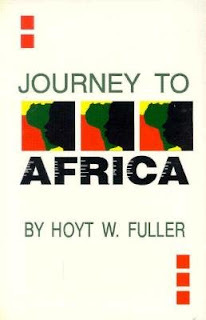 I have been intrigued with Hoyt Fuller recently, especially after reading some of his articles in the Black World periodical, a very important journal of the 1970s. I am very fascinated in the reasons as to why this important periodical was forced to fold in the mid-1970s. I am grateful for the contributions he provided writers like myself from a younger generation, particularly his defining and support of a Black Aesthetic. His life and work, like Toni Cade Bambara, is a very important instructive lesson for me. Dudley Randall wrote about Hoyt Fuller: “he resigned from Ebony because he thought it was not relevant enough to the Black struggle for freedom and equality. He could not play the game of “making it” if it meant losing his self respect. Much earlier in Detroit he had decided that he would never sacrifice his personal integrity to enter the American mainstream.” I can’t help but think of how much we, as individuals, can threaten our personal integrity so much in so many dangerous, insidious ways in order to enter the American mainstream. Fuller himself says in Towards a New Black Aesthetic: “Black Americans are, for all practical purposes, colonized in their native land, and it can be argued that those who would submit to subjections without struggle deserve to be enslaved.” This reminds me of the famous Harriet Tubman who said that she could have brought more slaves to freedom, if only they in fact knew they were in slavery. I am astounded each day that I live as to the number of people, consciously or not, that wish to remain in slavery. Freedom is very important. Unlocking the shackles of the mind; Bob Marley sung that we should emancipate ourselves from mental slavery. I was reading a few selections from his influential Black World, and came across this astounding selection from Toni Morrison: “The concept of physical beauty as a virtue is one of the dumbest, most pernicious and destructive ideas of the Western world, and we should have nothing to do with it. Its absence or presence was only important to them, the white people who used it for anything they wanted–but it never stopped them from annihilating anybody. And if we are relating to each other better because we have been convinced that the person we are relating to is [physically] beautiful–LORD, it is too tired to think about. I personally would rather stare at Fanny Lou Hamer’s picture than Jean Shrimpton’s not because Fanny is more [physically] beautiful (she probably is) but because I prefer to look at life lived. This reminded me of the appreciation we can gleam from a photo of someone especially if we know about their experience. We can look at a photo of Fannie Lou Hamer with an appreciation of what Morrison calls the “life lived” and appreciate such a life, and thereby deem her indeed, more beautiful, because we appreciate the fact that she as a citizen pushed society to stop its oppression and in that sense, is more beautiful to us. This is changed definition of beauty is very significant to me, Rhone Fraser, as a writer. It is changed from a physical definition to a definition measured by how much one’s life is involved in the liberation struggle. The definition of beauty is part of the Black Aesthetic. This is part of what was known in the early 70s as the Black Aesthetic and was something Morrison, Hoyt Fuller, and Addison Gayle, Jr. spoke profoundly to. Gayle writes: “the Black Aesthetic then, as conceived by this writer, is corrective–a means of helping black people out of the polluted mainstream of Americans, and offering logical reasoned arugments as to why he should not desire to join the ranks of a Norman Mailer or a William Styron [or a Jean Shrimpton].” Part of getting out of the polluted mainstream of Americans is coming to the understanding that Dudley Randall writes: “far too many otherwise intelligent Blacks refuse to acknowledge that it is inherent in the American system that Blacks must plead and appeal while whites gradually accede, without changing their basic structures.” One of these basic structures is the oppressive two party system that refuses to address the root causes of poverty in terms of education and healthcare. Obama’s and Clinton’s changing political platforms proves not only what they have to do to be president, but how much they must plead and appeal to the powers of the Federal Reserve, whose Republican party is in power, without changing their basic structure. Early in Obama’s campaign he called for universal healthcare and immediate withrawal from Iraq. Now in his campaign he as appealed so much in order to be president, that he has changed his political platform by relegating healthcare more and more to the private industry, which is not going to address the deplorable lack of healthcare. He has also changed his policy on Iraq by first calling for immediate withdrawal. Now he has vowed to keep troops in Iraq until 2011 if he is president. What Randall said about blacks continually appealing to whites who do not change their basic structures is important and true. What they have presented us younger writers is framework to analyze current situations, and the tools to essentially deconstruct in as many ways as possible these oppressive basic structures. See www.runcynthiarun.com. Thank you Hoyt Fuller, Toni Morrison, Addison Gayle, and Dudley Randall for helping clarify this definition of a Black Aesthetic, through your written works and your lives. -RF.